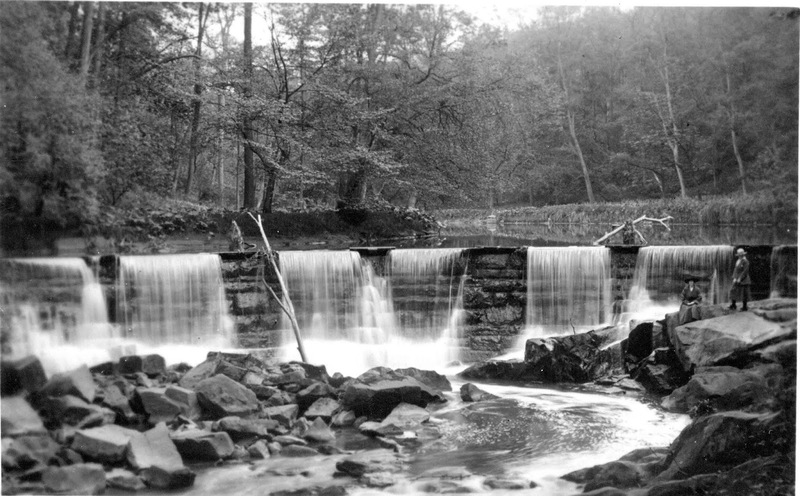 The Weir on the River Darwen as I remember it around 1977. 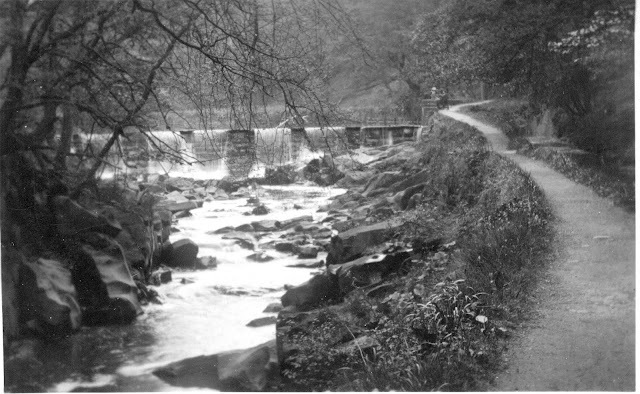 The mill race was still in use, and you had to walk the narrow path along the riverside. My father, Eric, and Uncle H Miller-Crook, as local joiners on Chapel Lane corner, used to repair three of the footbridges along this path.. This would be one of them. 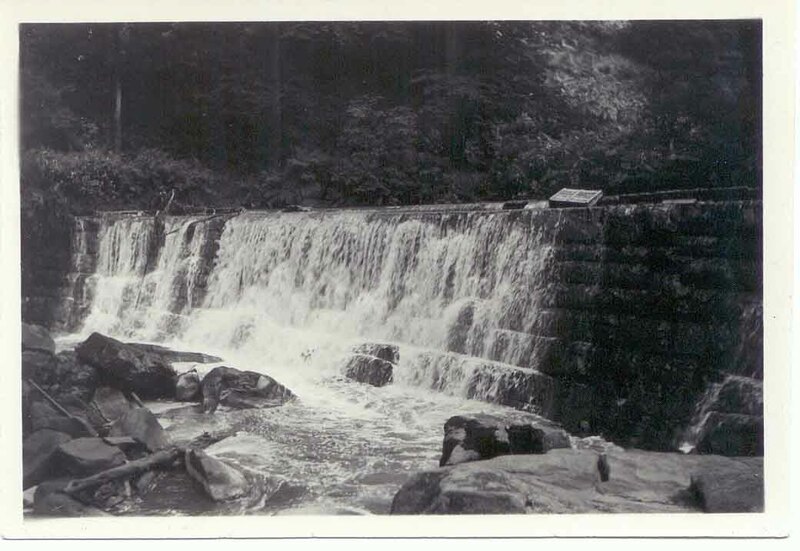 This is quite an early photo according to Herbert, as in later days, the bridge would have had a rail on either side. 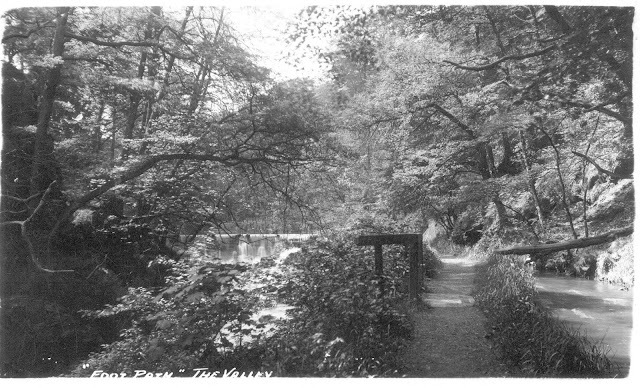 It used to be a lovely walk between river and mill race (shown on the right). When the "cut" or "race" was filling faster the the mill's waterwheel could use it the small waterfall acted ast the overflow and the water went back down under this little footbridge into the river. Back in the early 70's you could look in through an opening on the side of the mill and watch the waterwheel turning. 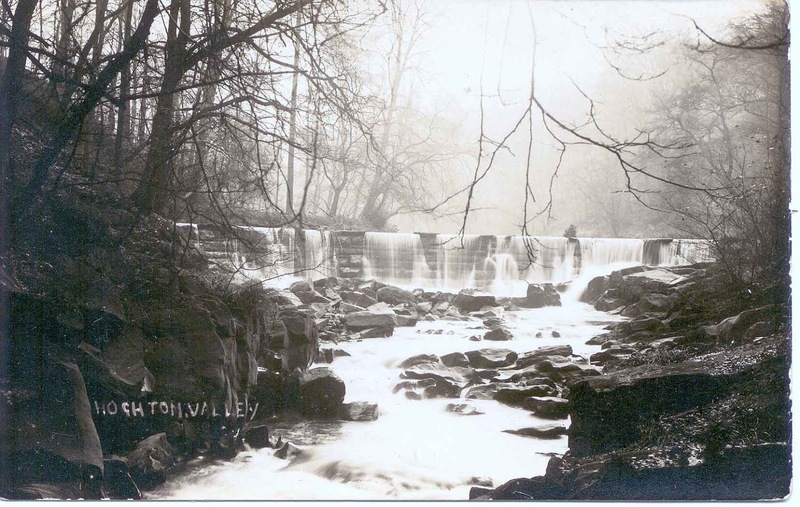 I remember being frightened as a child seeing the water disappear as a raging channel under the mill. This path used to be a favourite stroll for the mill workers. My own grandmother, Mable Windle and sister Marion must have come down here often with their friends. They worked in higher mill and lived at the Barracks on Chapel Lane. Quaker Brook Brow (the cottage), as it was known in the Smith family, was the home of John Smith (1833-1894) following his marriage to Ann Crook (1833-1890). John was born and raised in Seed House farm in Samlesbury, where both his father (William 1808-1882) and grandfather (John 1770-) farmed until around the 1850s. Ann Crook came from Coppice where both she and her father were hand loom weavers. 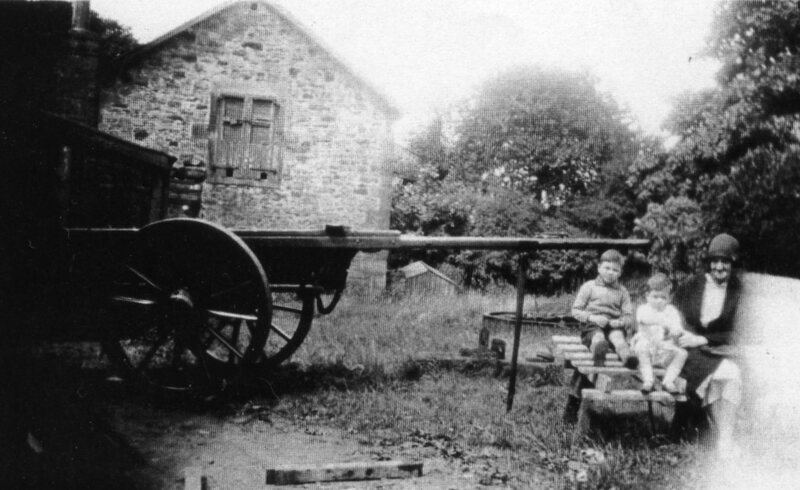 John and his wife lived at Quaker Brook from 1859 until they moved to Blackburn in 1873 for John’s work. John was a joiner and Ann continued with her hand loom weaving in a back downstairs room of the cottage. She would take finished cloth to the Cotton Exchange in Blackburn and receive fresh supplies of warp etc. to weave more. It is reputed in the family that when Samlesbury Hall was being restored by Joseph Harrison, a prosperous iron works owner from Blackburn, in 1862, it was John Smith who built the new staircase. 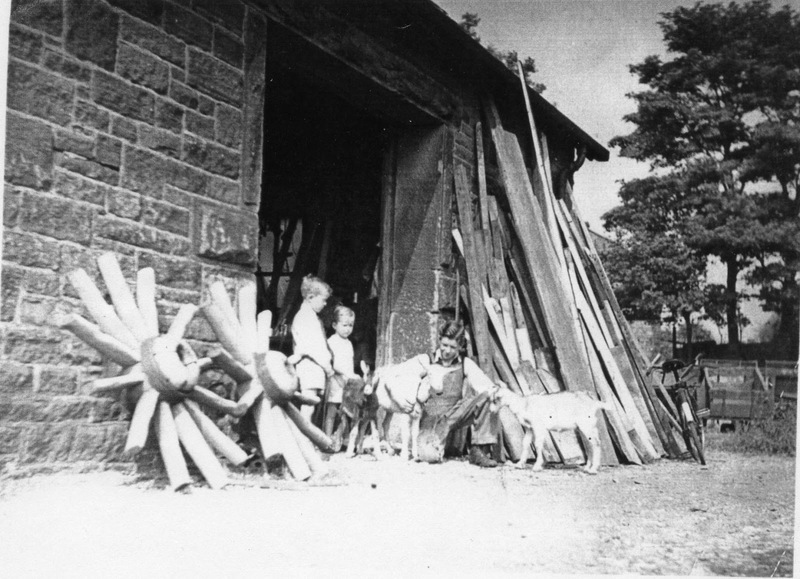 During their time at Quaker Brook Brow, John and Ann had five children. Their sixth child was born in Blackburn in their new house shortly after they moved there in 1873. One of John and Ann’s sons, also John, became a cotton weaver, but by the time he was in his 20s he had become a professional musician, and went on to play violin in various music theatres and resort orchestras in the late 19th and early 20th century. John junior’s son Herbert (David’s father) was also a professional musician who spent his career as a violinist with The Hallé and BBC Northern orchestras. Information and photo courtesy of David Smith (Te Horo, New Zealand), great grandson of John Smith. 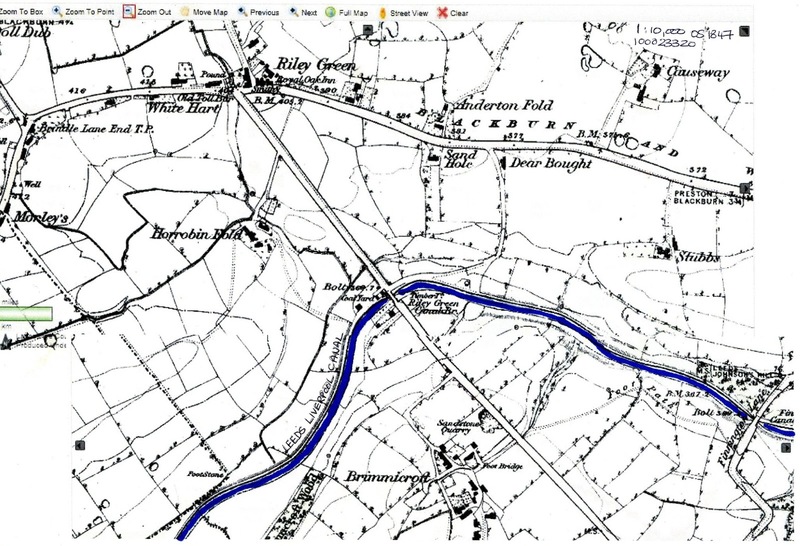 At the 1861 census, that corner (Roach Road, near Stanley Grange) was called Tallen’s Lane, and a 1848 map shows it as Tallen’s Lane End - before Stanley Grange was built. An 1894 map has "Talentine Farm" written next to the cottage. If you enlarge it and look carefully behind the tree to the left of the picture, you can make out the wall on Roach Rd surrounding Stanley Grange. Also, the silhouette of the Grange is just visible through the branches of the tree. 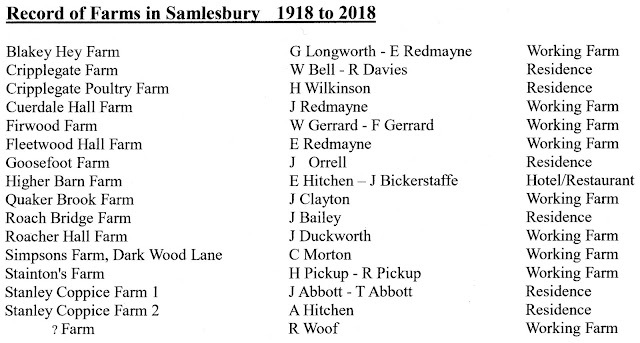 The Samlesbury Farms as remembered by Herbert and Maj Miller-Crook. Again if you wish to propose additions please let me know. 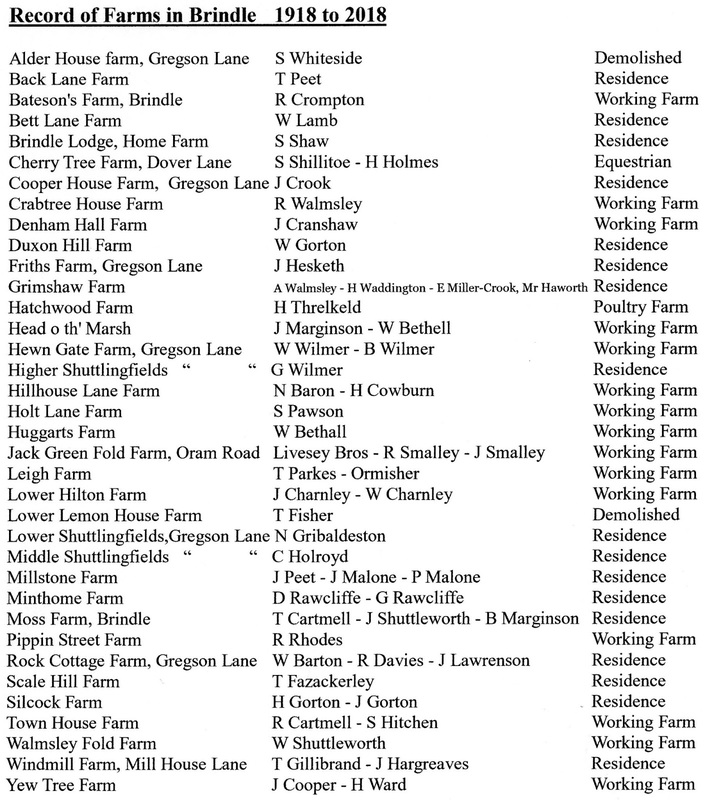 Following on from the Hoghton farms, here are the Brindle Farms, courtesy again of Herbert Miller-Crook! If there are any errors or proposed additions, please let me know. Herbert Miller-Crook, my uncle, with his super-power memory (despite being 92 year's old! 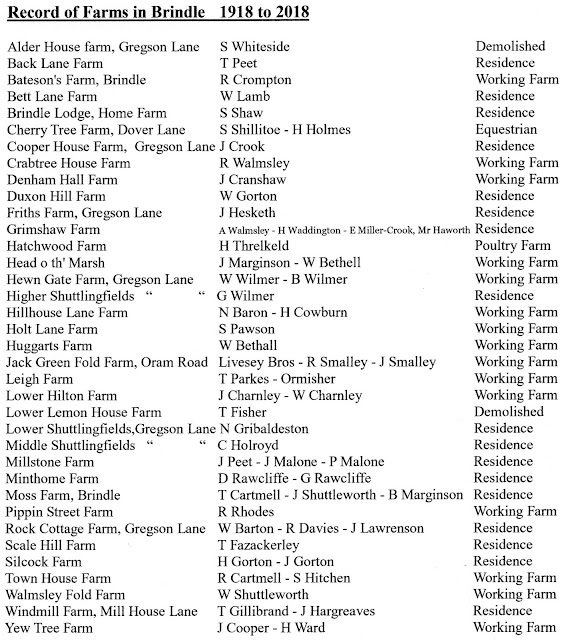 ), has very kindly composed a list of all the farms he remembers in Hoghton, Brindle and Samlesbury. No doubt, his wife, Maj (née Smalley) herself a farmer's daughter, from Causeway and Ward o'th Hill Farms, has also assisted him in this epic work! Thank you! My Grandfather, Thomas Miller-Crook b 1st June 1894, was Hoghton's wheelwright/blacksmith and joiner/undertaker. Thomas volunteered to enlist in the army joining the R.A.O.C. (Royal Army Ordanance Corps) at Heaton Park, Manchester - aged 20. He served in France as a wheelwright and blacksmith during WWI based at Abbeville in Picardy on the bay of the Somme. He was based there for three years helping to repair and fit wheels on the large horse drawn gun carriages. In 1919 he transferred to the Army Reserve and returned to civilian life. After working for his uncle at the Boatyard, Riley Green for several months and then at J Waring, Feniscowles for three years he decided to become self-employed in 1923. No doubt Hoghton Smithy used to be very busy. Ideally situated on the edge of Blackburn Old Road (corner of Chapel Lane) to capt the passing trade, it was also in the centre of the village. The Post Office used to be 100 yards from the Smithy down Chapel Lane, run by the Southworth family. The hamlet of Hoghton Bottoms was thriving with the two cotton mills. There was also a corner shop down on the corner of Valley Road. 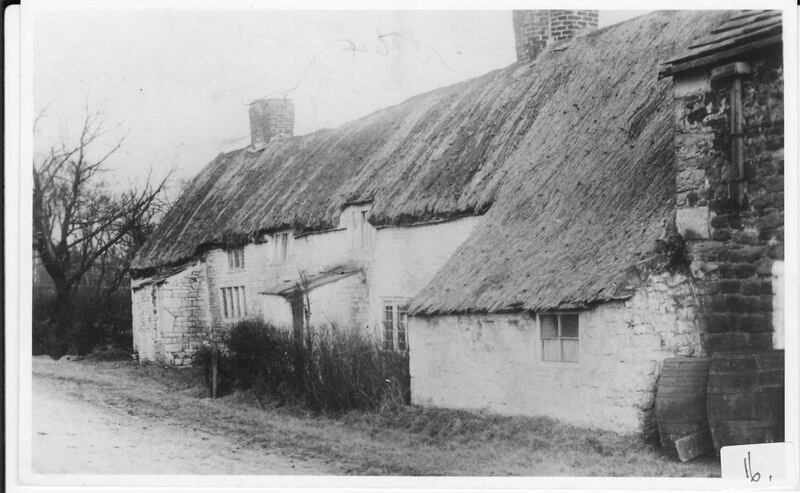 Next door, the Boar's Head Inn would also have brought potential customers - not forgetting the local farming community which also needed repairs to the farm equipment and shodding of the horses. Plenty of work therefore for a blacksmith and wheelwright! Herbert was their first child, born 16th November 1925, followed by Eric, my father, 13th October 1929. This photo shows my grandmother, Mabel, visiting the yard with her young boys. Both children attended Hoghton School, and Blakey Moor Secondary Modern in Blackburn and started work at the Smithy and joiner's shop as soon as they were of suitable age. The photo is of my father, Eric, next to the joiner's shop door showing two children his goats. The farmhouse gable end behind is Barrack's farm, which now lies derelict, - belongs to the De Hoghton estate.. Here we see Eric and my Grandfather Thomas, heating the bands of iron to fit over the cart wheels. The yard with Chapel Lane running along the hedge side. Notice the motorbike with side box! 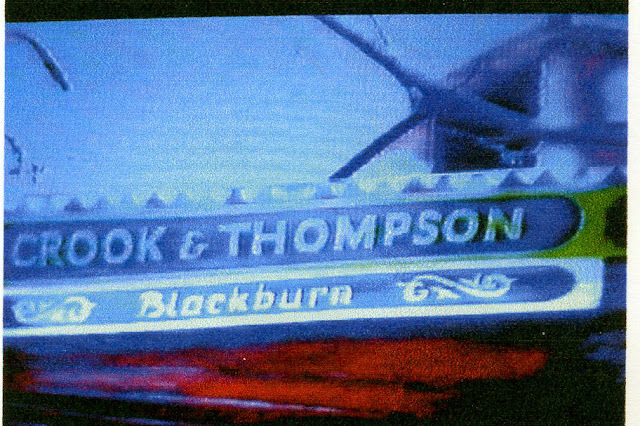 Following on from the post about The Boatyard at Riley Green, Crook & Thompson Ltd was formed by one of Thomas Miller Crook sons - Eli b 1844. He was the youngest of the nine children of Thomas (b 1798) and Rachael (née Wadsworth). Born at Brimmicroft farm in 1844, he married Anne Elizabeth Thompson at Holy Trinity Church 20th December 1866. Ann was the daughter of Thomas Robert Thompson. He was formerly an innkeeper and farmer, of Hoghton Lane, Hoghton, the inn being the Railway Tavern, now known as the Sirloin, Station Road, Hoghton. Eli was a boatbuilder at Riley Green in his father's business. Upon his marriage, he left to set himself up as a coal distribution agent. He incorporated his wife's name in the company naming it Crook & Thompson Ltd.
Eli had six brothers and two sisters. Both John, (see Stanley Grange Post), Alexander, and Ralph (see Horrobin Fold post), like their father, had all distributed coal. 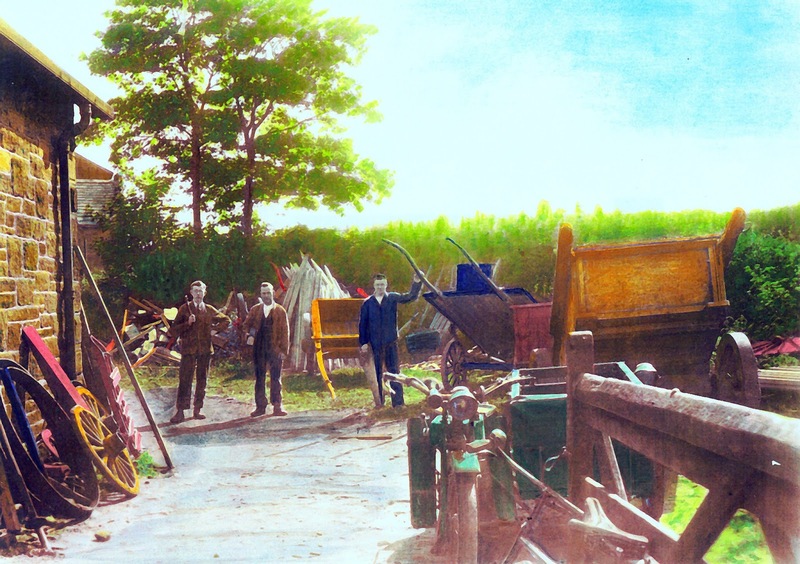 Since the Leeds Liverpool Canal had been built right next to their farm in the hamlet of Brimmicroft (off Bolton Road) Riley Green they would have seen barges passing delivering coal from the Wigan coalfields since they were young children. The canal had opened officially in 1816. His father Thomas had had the good idea of founding the Boatyard for repairing his own barges and manufacturing new ones. The family made good use of the opportunities I would say, being blessed with the proximity of both the canal and coalfields. They had a recipe for success and exploited it fully. Hard grafting but with plenty of financial reward! This section of the canal was completed between 1812-1814 and the Leeds - Liverpool canal opened officially on 19th October 1816. 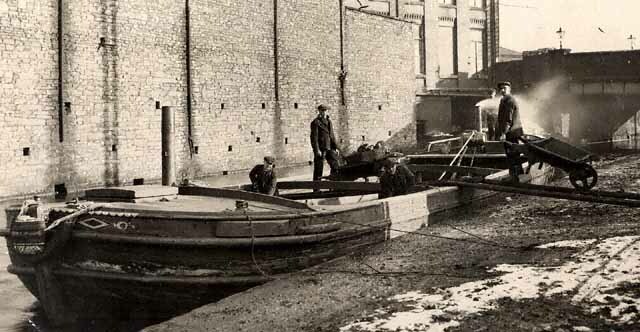 (Barges had reached Blackburn from the Rishton side by 1810). 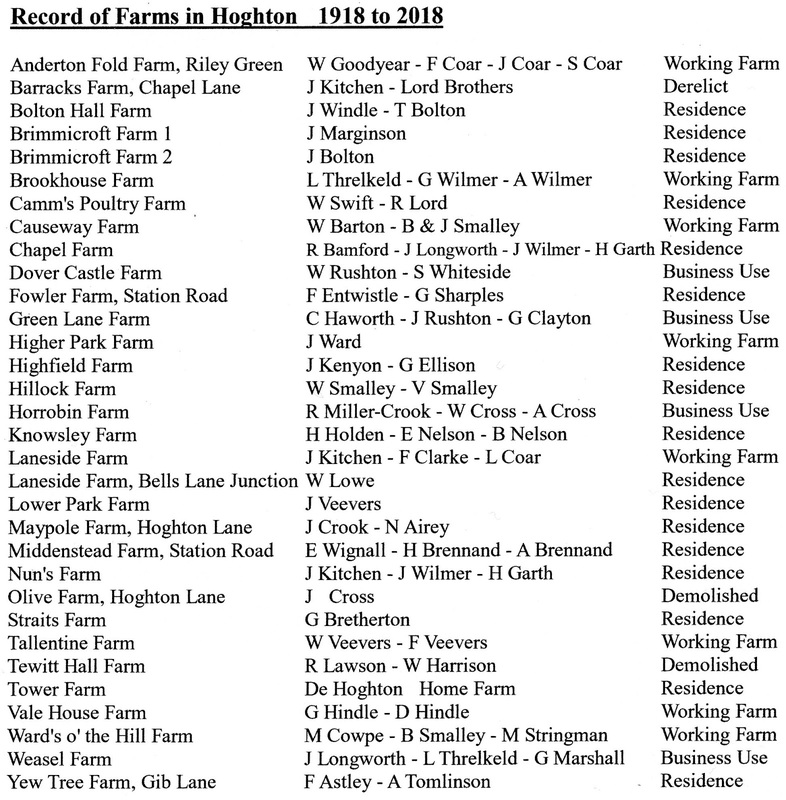 By the time the next map was published in 1891 the new Horrobin Farm had been built on the side of Bolton Road. Eli and his wife set up home at Witton after their marriage, 9 Broomfield Place. A daughter, Ann, was born here in 1871, but she died aged 3. The following year, 1875, a son Thomas Roland Crook was born and two years' later a girl, Rachael in 1877. (The barge below was named after his son). A later post will mention the destiny of Thomas Roland' son Tony Crook, who became a famous racing driver and owner of Bristol Cars Ltd. 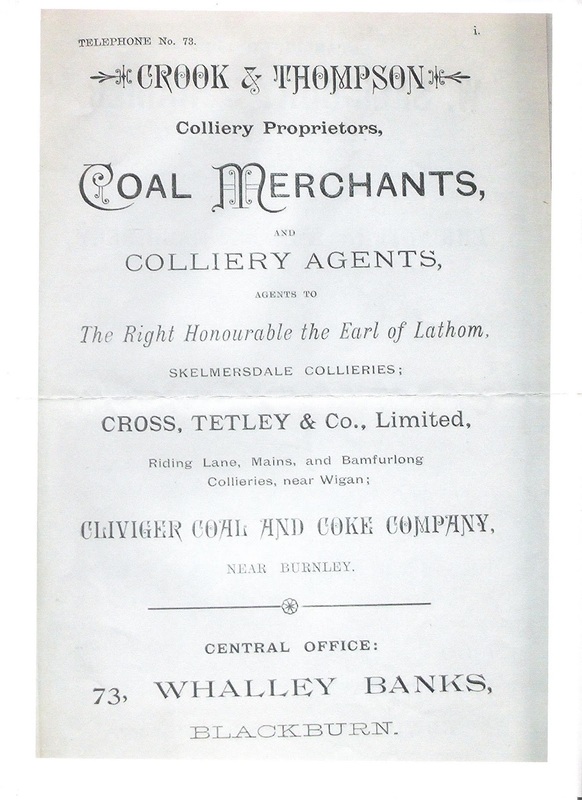 The offices of the company were located at Whalley Banks only half a mile from the house. 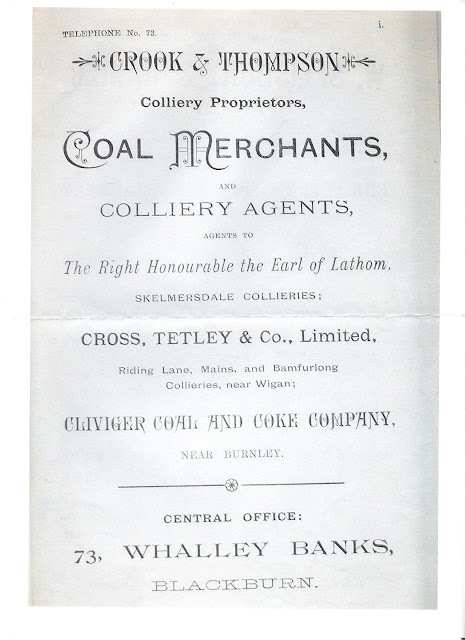 The photo below shows an advert for "Crook & Thomas Coal Merchants" on a gable end at Whalley Bank or Bank Top as the area is more well known. 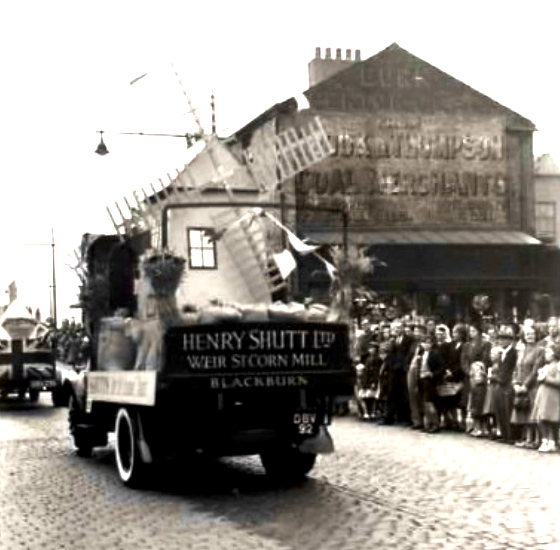 The advert isn't very clear but it dates from the 1951 Blackburn Carnaval and is courtesy of John Cox. My friend Colin Pritt, a local historian, owner of Blackburnpast.com very kindly sourced it for the blog. 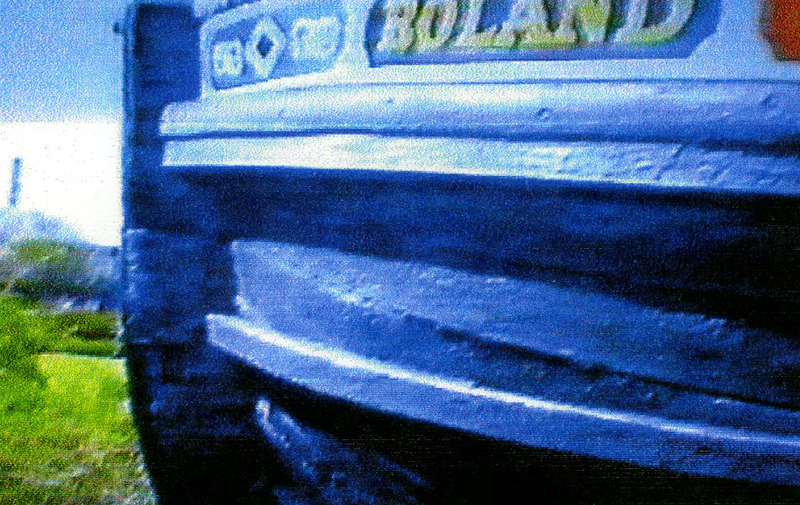 Crook & Thompson conveyed the coal by horse-drawn barges direct from the Burnley and Wigan coalfields to the canalside mills of Blackburn and Accrington. Blackburn had the largest number of cotton mills. In 1867, approximately 45 mills had been built alongside the Leeds Liverpool Canal. Each week, at this time 6.250 tons of coal per week were needed to fire the mill boilers. Between 1867 and 1900 another 18 mills were built, bringing the total to 63. The weekly coal consumption rose to 8,750 tons! 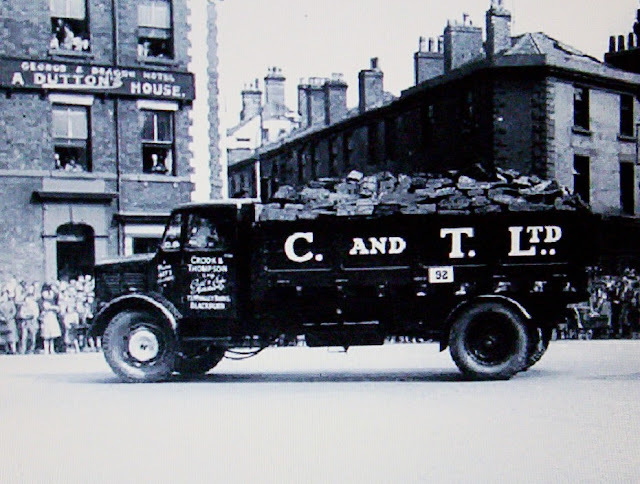 Most of this tonnage was shared by two main companies, Messrs Hargreaves Ltd from the Burnley coalfields and Crook & Thompson Ltd from the Wigan coalfields. 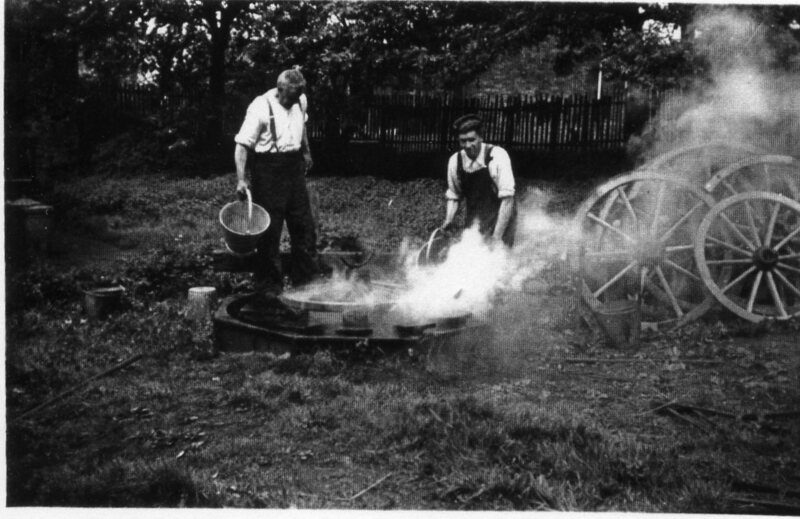 The coal was unloaded by wheelbarrow into large wooden hoppers and distributed for domestic consumption. To reduce the cost of buying from the mine owners, Eli eventually became a "Colliery Owner" although unfortunately I do not know which one it was! If anyone can help me trace the name I would be very grateful. I am told it would be amongst the Wigan coalfields. The amount of coal transported by barge to the yard at Lower Audley for domestic purposes eventually declined as the railways expanded. 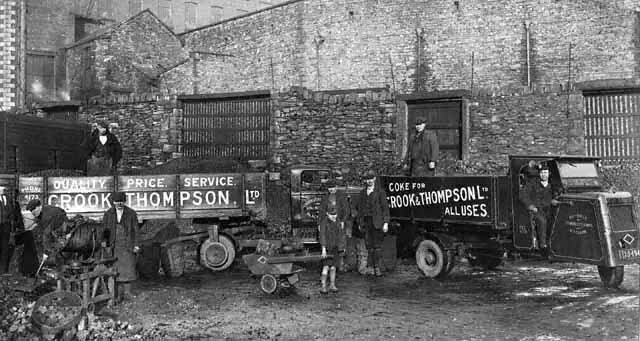 To take advantage of the coal transported by rail, Crook & Thompson Ltd established a large depot with the railway sidings at Whalley Banks, Blackburn. Coal continued to be transported by canal barges, fitted with diesel engines, until the decline of the cotton industry in the 1950's. The barge "The Roland" was the subject of a booklet mentioned in the post entitled "The Boatyard". After living in France for 30 years, in Saint Etienne and Clermont Ferrand, I started this blog as a nostalgic pastime! I always had an interest in local and family history. I was born in Hoghton, in 1963, left to live in France in 1983 but returned to live here in 2013 at the age of 50! Click on "comments" beside "Labels" underneath the photo or post. Choose the "Google Account" from the drop down options. If you don't already have a Google account, why not create one? It only takes a couple of minutes and it will allow you to be identified automatically with your comment. If you don't want to create an account, choose "Anonymous", but include your name at the end of your comment. Your comment is read by the moderator, and then will appear, normally within 24 hours, under the post. Clicking on the list of "Labels" below, will allow you to change pages according to the subject you wish to view.